Fall is a dynamic season: students return to school; the leaves change from their usual shades of green to a mixture of red, orange, yellow, and brown; and the dense heat and sticky humidity of summer are replaced by cool, Autumn breezes. But, despite the beautiful changes to the foliage, many people have difficulty finding time to get out and truly enjoy these seasonal trademarks. Thankfully for them, TakeTours.com makes booking fall getaways as easy and stress-free as sitting down to a warm slice of pumpkin pie and a mug of hot apple cider, so you can always find the perfect tour through the mountains and forests of New England for you and your family. Below, we have included a few tours that will immerse you in the beauty of Autumnal New England. See the colors of Autumn before the leaves are gone! Time to put your comforter back on the bed. It’s that time of year! Football, layered clothing, and apple cider, among other things, let you know that Fall is here. In the northeast area of the United States, the changing of the seasons is apparent not only with how people adapt to the weather. The scenery is changing dramatically as green trees have started their change to yellow, orange, and red. Unfortunately, the stunning views that result from this change are only temporary. After only a few weeks, trees become bare and lose the vibrant colors. Cold weather overtakes the region and the momentary collaboration of colors is gone. 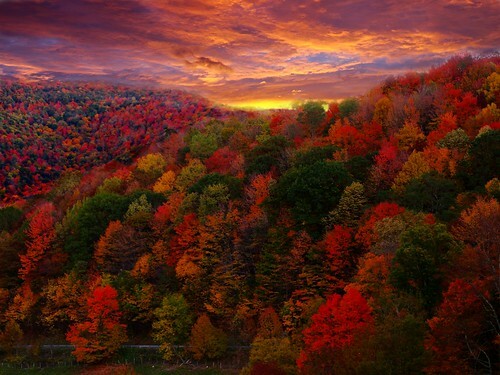 At TakeTours, we have special Fall Foliage tours that bring you to some of the best leaf peeping areas of the northeast. With tours departing from New York, and tours departing from Boston, there are many options for your traveling pleasure. Book today to make sure that you don’t miss out on this limited-time viewing experience! Author ivymedia adminPosted on October 11, 2011 February 25, 2019 Categories Fall FoliageTags Fall, Foliage, Leaves, New England3 Comments on See the colors of Autumn before the leaves are gone!